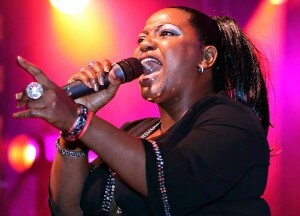 Angie Brown (born 28 November 1963) is a female singer/songwriter from Brixton, in South London. Brown, whose vocals have been featured on tracks of diverse acts ranging from Fatboy Slim to Lisa Stansfield & The Wah Brothers, is more famous as the featured vocalist on Bizarre Inc‘s two #1 Hot Dance Music/Club Play hits (“I’m Gonna Get You” and “Took My Love“, both from 1993) and as the featured singer on Motiv8‘s top ten UK track from 1994, “Rockin’ for Myself.” Before this, she was a member of the group The Doves, and performed lead vocals on their single “Beaten Up In Love Again”. One of Brown’s most notable appearances was on the ITV programme “Club Reps” in which Angie was the star attraction in the resort during that evening. Angie or “Ange” as she was often called put on a remarkable performance during her brief spell at the Greek resort. Angie Brown calls herself the original South London Girl as she was born in Clapham. She grew up in Brixton and began her singing career in the early 1990s. Angie started out as a freelance singer doing sessions and toured with major names throughout the world. Angie’s biggest hit to date was in 1992, with “I’m Gonna Get You” which reached Number 3 in the UK charts in October 1992. Her vocals featured heavily on the track, which was created by 3 young DJ’s/remixers from Stratford called Bizarre Inc. For all involved, it remains their biggest hit. She teamed up with Bizarre Inc again the following year on “Took My Love”. Angie has also sung backing vocals for the likes of Grace Jones, Beverley Knight, Mark Morrison, The Rolling Stones, Kate Bush, Chaka Khan, Heaven 17, Neneh Cherry, Lisa Stansfield, Mola Mola, The Stereophonics and Fat Boy Slim. Angie’s other big hit was with remixer Steve Rodway, better known as Motiv 8. Their collaboration “Rockin’ for Myself” peaked at Number 18 in the UK in May 1994.